I have a love/hate relationship with fabric. 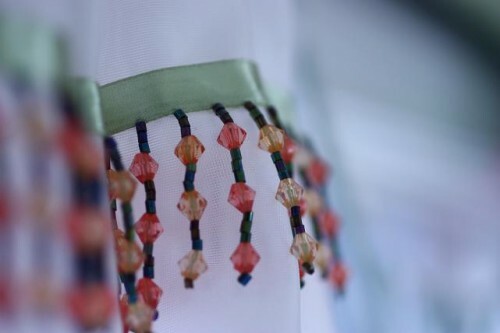 The designer fashion fabric that drapes on my body for pennies on the dollar… I LOVE. However, the kind of fabric I buy in a bolt willing me to create easy masterpieces for my windows so that my house is truly a home, well….I run from that. And yet I don’t. Let me explain. Fabric makes me SO happy. There have been a few yard sales at some of the “richer” neighborhoods where the women had out gobs of their fabric for free, so I took it. It was gorgeous, and gazing at the possibilities made me anticipate the “what could be” in my great room, dining room, kitchen, bedrooms, etc. etc. This is one area in my decorating where I am stuck and I will not pay someone hundreds of dollars for a window treatment, so I WILL learn this summer (without sewing) and invite you along for my progress. So, I am taking baby steps and started off with the joy of some yard sale drapery panels, a hot glue gun and a little fringe. Many yard sales ago, I came across a family clearing out hundreds of craft items. There were oodles of fringe pieces that called my name. Now I am practicing with that fringe and some cheap $1 window treatments before I invest in something a bit more for my family room. Here are some plain sheer yard sale window treatments that just have the trim glued down about four inches on the panel. Ladies, it’s so EASY and if the one who runs from fabric can do it, so can you…. 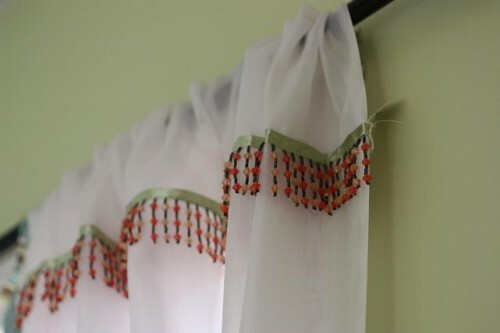 Just hot glue fringe to window treatments and hang. These are in my daughters’ room for the time being. The wonderful thing about fringe is that you can color coordinate it with other decor items like your cheap Goodwill lamps or yard sale finds. Yes, the lamp and window treatments match. 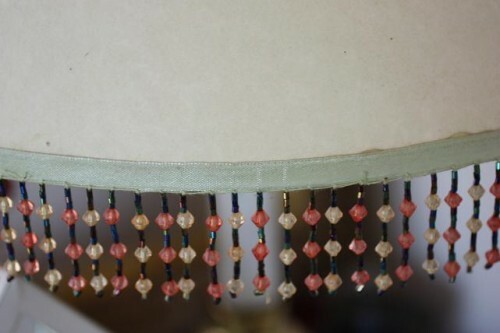 Just hot glue the fringe around the very bottom of the lamp shade for a wonderful accessory. But of course, nothing has to be perfect to be beautiful, so after we practically burned the house down, I just turn the lamp shade backwards. 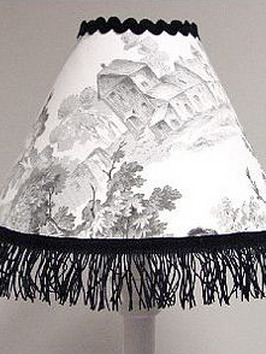 I will be re-purposing this lamp shade by tearing OFF the fringe and covering it with some of my yard sale fabric to dress it up and eliminate the burn mark. I bought this shade at Goodwill already finished, but how easy is this. Don’t you just LOVE it? They layered the fringe for such a great, girlie feel. 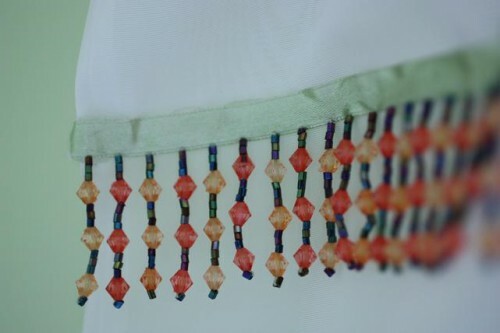 I would recommend you start at the bottom with your first layer of fringe and work up. That way you will have a polished look when you’re completed. Next yard sale weekend, pick up a cheap $1 lamp shade and have some fun. You’ll be amazed at what just a little fringe will do to dress up some of the more boring elements in your home. Decorating on a dime has never been so easy. This is going to make me get busy sewing curtains. I have bolts and bolts of fabric that I bought at a “closing business” sale and have yet to use. Time for new drapes! Thanks for the inspiration. Looking forward to this adventure with you. I have lots of naked windows, too. I’ve been clipping from magazines & online for ages, collecting window treatments/curtains that I find intriguing. We’ve been in our house for five years, it’s time to dress some windows! I’m SO GLAD you confessed the state of your windows!! Makes me feel so much better about mine that are in the same state:). 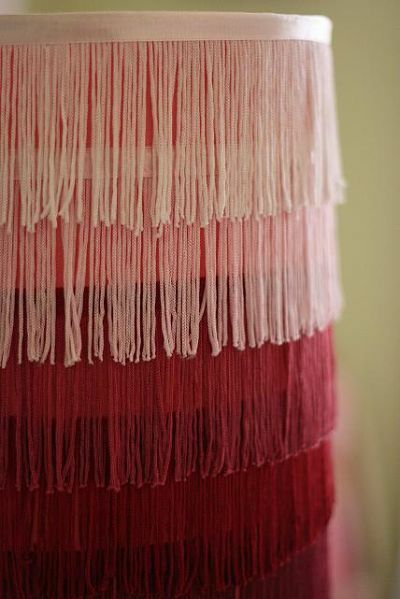 And I LOVE the fringed girly lamp! Very creative. I didn’t know what to do with my sons room. One is 22 months old and the other 6 years old. A little difference in taste. I cheated. I bought a paint drop cloth, did a mis-treatment to it & it looks great. I would love to find fringe cheap at a garage sale. My glue gun would be smoking! Jen check out thenester.com. Look in her archives for window “mistreatments.” I have made my own mistreatments and they are beautiful. Cheap, no sew and fun. She is actually a good friend of mine from church….and when I finally dig in, she is my first resource. 🙂 I still get overwhelmed with mine…so many and such LARGE windows, but I’ll do it…some day.